Vine-tangled jungles, ferocious blood-sucking leeches, rare orangutans and maybe poison-dart blowguns: those are the images that Borneo evoked in my mind. I was a little uncertain about what I’d experience during my three-week birding trip to Borneo this summer. First: Borneo is not a country. It’s an island, the third largest in the world. It’s in southeast Asia about halfway between Australia and Vietnam, near the equator. Three countries own sections of Borneo: Indonesia to the south, Malaysia to the north, and the tiny nation of Brunei on a slice of the north coast. We visited Sabah, a Malaysian state in northeastern Borneo, touring through the steamy eastern lowlands and cooler western mountains. 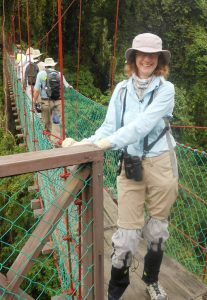 Intrepid Joyce Miller on bouncy bridge in Borneo, wearing “full battle gear” vs. the two biting leeches. 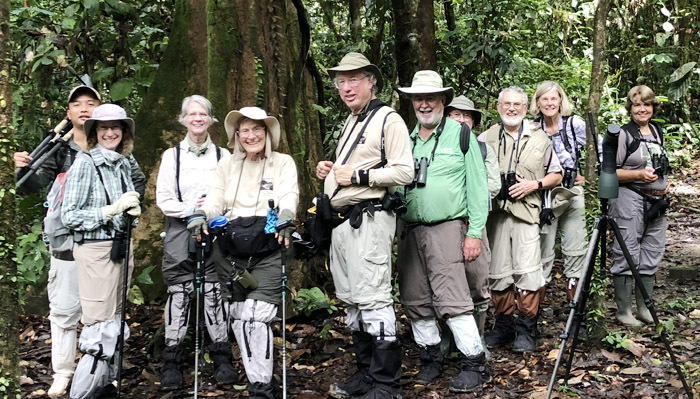 Birding friends have raved about Borneo, so I signed up for the waiting list two years ago for a small-group trip with the top-notch birding travel company Field Guides Inc., based in Austin, Texas. I started my journey on June 24, flying from Albany to Philadelphia to London to Kuala Lumpur to Sandakan on Borneo. I arrived after 25 hours of flights over four days, plus a 12-hour time change, a total of more than 11,500 miles. Our group of eight was led by guide Megan Edwards Crewe with local guide Hamit Suban of Borneo EcoTours. Most days, we woke up around 4:45 a.m., met at 5:30 a.m. for breakfast, left at 6 for a birding walk lasting until 11:30 a.m., then had lunch at noon. The next field trip ran from 3:30 to 6 p.m. After quick showers, we met to compile the day’s species checklist at 6:30 p.m., had dinner at 7, got ready for the next day’s activities and headed to bed. We also went on several night walks. It’s not everyone’s idea of a vacation, but we were on a mission to see as many birds and other wildlife species as possible. Rhinoceros Hornbill. 2016 photo © David Berkowitz, New York, New York. 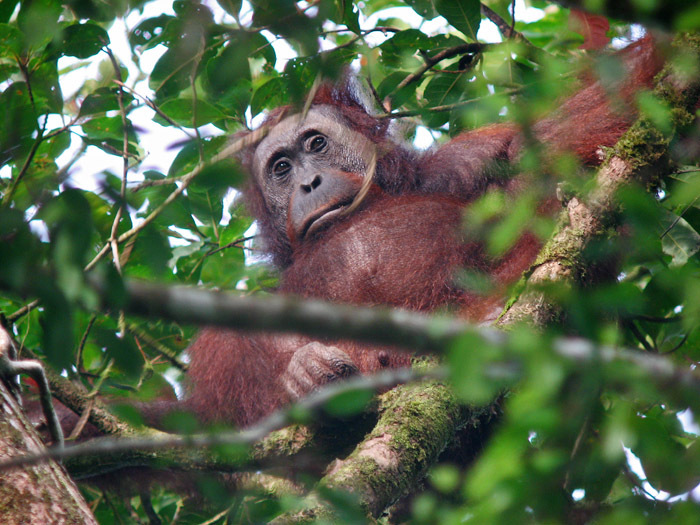 We were thrilled to see several orangutans, which are critically endangered. At the Borneo Rainforest Lodge, we enjoyed long looks at a 35-year-old male orangutan who frequently visited the lodge property. He plucked and ate young durian tree leaves then, at dusk, snapped off a few branches to pile into a bed in a tree. Two researchers sat on camp stools nearby, taking notes on his actions. I spent an afternoon at the Sepilok Orangutan Rehabilitation Centre, which cares for young orphaned orangutans until they are ready to be released back into the rainforest. From a glassed-in observation area, I watched young apes swing with long furry red arms along ropes strung across the lawn of their exercise area, wrestle each other and eat fruit on the feeding platform. One young orangutan entertained itself – and me – by somersaulting across the entire lawn. Three species of edible-nest swiftlets nest at the famous Gomantong Caves, the subject of David Attenborough documentaries. We covered up with rain ponchos to catch dropping guano, then picked our way along a slippery boardwalk into the huge limestone caverns. We gasped not only at the thousands of birds and bats in the murky darkness above us but also the black guano heaped on the cave floor, swarming with thousands of cockroaches, beetles and other insects. The swiftlets spin tiny nests with their saliva and adhere them to the cave walls. Local people collect the nests for bird’s nest soup, a delicacy in China. Bornean Bristlehead “bizarre and enigmatic” with “distinctive whining calls and screams.” Photo © guide Richard Webster. The busy Sukau Rainforest Lodge, located directly on the Kinabatangan River, was accessible only by motorboat. Every morning and afternoon, we’d coast along the river in small skiffs. We spotted several orangutans, turkey-sized hornbill birds, very rare Storm’s Storks, and an active family of five Borneo pygmy elephants eating grass and splashing in the river. During walks on the lodge boardwalks, we spotted pygmy squirrels the size of a mouse, giant forest ants more than an inch long, and barking geckos that sound like hoarse chihuahuas. 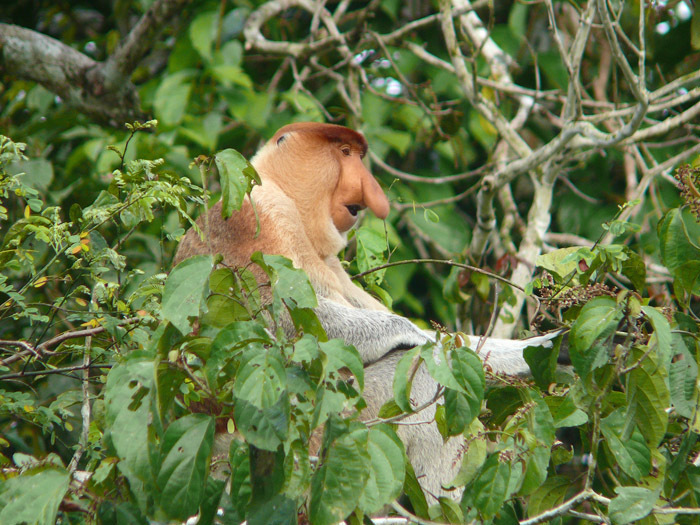 We spotted many family groups of endangered proboscis monkeys along the rivers. They are endemic, found only in Borneo. Their long straight pale tails looked like white candles hanging from tree branches, making them easy to spot. 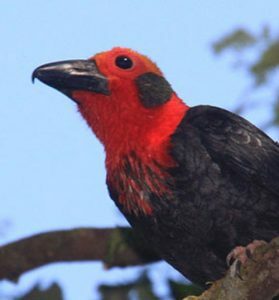 The males have famously goofy, droopy big “Jimmy Durante” noses. The females have small pert triangular noses, and most were holding babies. 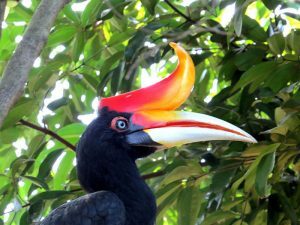 In the Danum Valley rainforest, we spent four days at the Borneo Rainforest Lodge, a spectacularly modern and elegant place 50 miles from the nearest paved road, 2 1/2 hours along a bumpy, winding gravel road. The meals were gourmet-level and abundant, ranging from cheeseburgers to banana-blossom curry. Decadent desserts were balanced with lots of fresh fruit: pineapple, papaya and dragon fruit. The people working at the lodges were knowledgeable, gracious, very good-humored, and spoke excellent English. One lodge nature guide told us that they work daily for many months and collect their days off so they can spend longer times at home with their families. Birds were easy to spot along the dirt roads in the mornings, but as the day heated up, birds retreated to the rainforest, so we did too. The mud on the narrow forest trails was thick, slick and goopy, like wet peanut butter. Even thought it was the dry season, it is still a rainforest, with short but torrential downpours on many days. Raffelsia flower, about the size of a beach ball. Photo © Alan Johnston of Maryland, another traveler on Joyce Miller’s Borneo trip. We were on alert for two types of biting leeches: small brown leeches and the larger yellow-and-black-striped tiger leeches. We wore full battle gear on hikes: waterproof Neos overshoe boots, lots of bug spray and leech socks. Leech socks are made of light-colored Christmas-stocking-shaped fabric to wear between socks and shoes. They fasten above the knee and prevent leeches from crawling through knit socks to bite ankles and cause copious bleeding. The light color helped us spot them before they got to uncovered skin. Two brown leeches started inch-worming up my boot but I plucked them off after a few tries — slippery and tenacious critters! One birder, getting ready to shower after a hike, discovered a leech had latched onto his wrist under his watch band. It left a round red bite. Another birder had a brown leech draped over her eyelid, but when our leader spotted it, brushed it off quickly. They carry no diseases, but the gross-out factor is huge. To spot birds hiding high in the tree canopies, we tottered along bouncy boardwalks suspended between enormous dipterocarp trees, which were more than 200 feet tall and hundreds of years old. 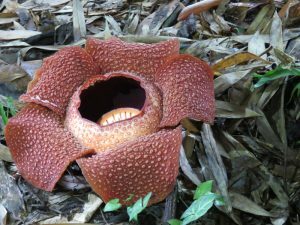 We visited a family farm that sold admission to see their rafflesia plants, among the largest flowers in the world. The warty red and beige flower is the size of a flattened beach ball, hollow and spiky in the center. Flies pollinate it, attracted to its rotten-meat smell. The family exhibited a traditional wooden blow dart pipe with a pouch of darts that could be tipped with poison. Hamit explained that this hunting method is still used in some areas of Borneo. For the final leg of the trip, we flew to the northwest coast to Kota Kinabalu, a thriving modern city. Buzzing mopeds, the mystical Muslim call to prayer and loud late-night Malaysian music were quite a shock after the melodic birds and buzzing cicadas of the rainforest. The endless oil palm plantations in the Sabah lowlands were replaced by steep mountains, red landslide streaks on mountainsides and occasional rice paddies. From there, we drove to Mount Kinabalu, more than 13,400 feet tall and a World Heritage site. It’s a knife-edge jagged wall of a mountain that reminded me of the Grand Tetons. Our lodge was at the entrance of the Mount Kinabalu park at 6,000 feet. To our relief, the weather was like a pleasant spring day: 60s during the day, 50s at night, but still very humid. In the mornings after a rain, the forest trails filled with wispy clouds. We saw more than 220 species of birds. Highlights for me were the weird orange and black Bornean Bristlehead, the turkey-sized Rhinoceros Hornbill and fantastical Asian Paradise-Flycatcher. That graceful bird, with a blue-black head and long graceful white tail plumes, landed on a branch near us and sang, displaying a lemon-yellow mouth. We watched a family of rare endemic Whitehead’s Trogons, as the red, orange and blue male stuffed a giant walking-stick insect into the mouth of a puzzled baby, not sure what to do with the gangly food. I added 201 new species to my bird life list, for a total of 2,820, about 26% of the world’s more than 10,700 species. Despite the leeches and heat, Borneo is one of the most welcoming and dramatic places I’ve visited. I’ll rave about it now too. At Borneo Rainforest Lodge — The travel entourage, including Joyce Miller, left foreground. Behind her is a local guide. At right: Trip leader Megan Crewe. Third from right: Alan Johnston, whose camera took the photo. Next: Tim Meadows was JUST so darned funny!